Getting pulled over by the police is a nerve-wracking experience for most people, but for 7-year-old Jacob Hudson, it was absolutely anxiety-inducing. Jacob has PANDAS -- pediatric autoimmune neuropsychiatric disorders caused by streptococcal infections -- his mom, Adrianne Hudson, told CBS News. The 7-year-old, who suffers from anxiety, was with his mom when she was pulled over for speeding in McKinney, Texas, earlier this month. "I usually don't drive in McKinney at night, and I didn't pay attention to the speed limit," Hudson told CBS News. "It was pretty dark and Jacob and I were driving and I said, 'Oh my goodness, I think I'm getting pulled over.'" Officer Adam Hamilton of the McKinney Police Department stopped Hudson and walked over to her car. Hudson said she was taught to keep your hands on the wheel, look at the officer and be very polite when getting pulled over. But she was nervous about what Jacob was doing in the back seat. "Jacob is freaking out, saying he's going to run out of the car," Hudson said. Her son was in distress. "I guess he told the officer, 'Just give her a ticket,' because he wanted to leave." The bright, flashing lights and blaring siren while getting pulled over were "sensory overload" for Jacob, Hudson said. It turns out the officer was very understanding of the boy's state. "I don't know if it was the exchange that Jacob was nervous or what happened, but that's when Officer Hamilton basically said, 'You don't need to be afraid. Do you like police cars?'" Hudson said. Hudson realized Officer Hamilton had a plan to calm Jacob down. She talked her son into getting out of the car and joining the officer to check out his police cruiser. "I can't say this enough ... I was so taken back by Officer Hamilton," Hudson said. "He calmed my child when he didn't know what was wrong with him. He didn't know my son had a disability. He just saw a child who was upset and wanted to calm him down." Hudson knows that the officer could've treated it like a regular traffic stop, given her a ticket, and left, "but he went above and beyond and to get the child out of the situation ... and to me that's amazing and that's why I shared the story." Hudson's post about Officer Hamilton went viral on Facebook. The McKinney Police Department also posted about Jacob and Officer Hamilton's bond and invited the Hudsons to visit the police department. Hudson says she is happy Jacob's anxiety was eased and that she was able to raise awareness for PANDAS. 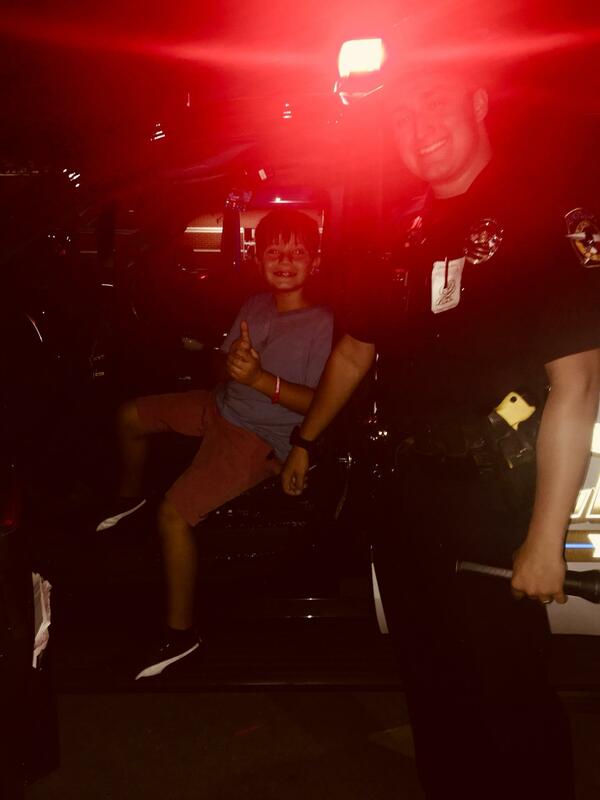 Jacob was happy he found a new hero in the police officer who helped him. "The whole ride home was Jacob saying how he wants to have a police party, he wants to be a police officer when grows up, how the officer changed his life, how he loves his community heroes and its nothing to be afraid of," she said. "Officer Hamilton is a hero in my eyes ... and I hope he gets promoted," Hudson said.